Rottweiler Dogs - Do you really know what they're all about? The best way to get to know the real Rottie is by reading personal stories from other owners. Most people don't understand what Rottweiler dogs are like at all. Most people just think of they're big scary guard dogs. Because of their inherent protective traits, they do make great guard dogs but there's so much more to them than that! I have more stories than I can count, based on my own personal experiences with my female Rottie Savannah, and my boy Chevy. I even have a story or two about Rottweiler mixes that you should check out - adorable. Rottweiler dogs can be so darn funny! When we first brought our male Rottweiler Chevy home, he needed a bath. I worried it was going to be a struggle, but instead he jumped right in the tub. So it seemed he liked water. . .
A few weeks later, my neighbor invited us over to play in her dog Lucy's brand new pool. It was a real pool, the kind with a vinyl bottom and metal sides, etc. We went into the back yard, Chevy saw the pool and went completely berserk. He jumped right in and started splashing. He then went crazy with both front arms splashing as hard as he could. . .
My husband and I had our female Rottweiler Savannah for 7 years, and during that time I came to realize that she would destroy every single toy I bought her. So, when we brought Chevy home I knew I had to find something that he couldn't destroy instantly. So I found this rubber tire called a Tire Biter, and he LOVED it. He actually puts both paws on it and hikes it between his back legs, which was not cool inside the house, so it has to stay outside. While I have some funny video of it that I need to find and upload, that isn't the funniest part. . .
One day my husband brought some wheels and tires into the front drive so he could sit down and polish the wheels. When Chevy saw that big tire, he ran right over to it. He turned his head sideways and started gnawing away on it - one of those things you really had to see to appreciate, but I couldn't stop laughing long enough to make him quit. This is not my own story, but one told to me. . . Did you know that Rottweiler dogs can see in 2-dimensional? They say that dogs can't really tell what's in a picture which is a 2-dimensional format, but I beg to differ. A calendar was on the wall for the month of July, and when August arrived, Martha (Moose's mom) changed the calendar over, it happened to have a picture of a cat on it. When Moose saw the picture, he sat in front of the calendar and barked at it. Can you picture that? Because he wouldn't stop barking at the cat, she actually had to change the calendar to a different month. I don't know about you, but when I first heard that it had me laughing so hard I could barely breathe. This story is a little scary, and please keep in mind that Chevy is a Rottweiler Rescue and he came to us with some pretty serious issues - most of which we've worked through over the years. We used to have a couch in front of our living room picture window, and Chevy didn't like anyone walking past our house. He used to jump up on the couch, put his paws on the window sill and smash his face sideways against the glass. One day we went somewhere, and when we returned my husband hollered as I was unlocking the door "is the dog alright?" I asked why, because I hadn't even seen it. . . Unfortunately, we had joked that someday he was going to break the glass. . . .Well, the whole center pane was busted out with a long pointy shard hanging down right in the middle. I ran in the house and found Chevy hiding on the other side of the bed with a look on his face that said "I know I'm seriously in trouble, I was a bad dog." He appeared to be perfectly fine. Thank God he didn't go all the way through the window, and how he didn't get one single cut on him I will never know. The thing that I wonder most about though. . . I used to drink a lot of chocolate milk and had a tendency to leave my glass sitting on the coffee table. When Savannah was about 8 months old my husband and I returned home to find that she had eaten one of my chocolate milk glasses! There were a few larger pieces and the base, which had been licked clean, but not nearly enough to put the glass back together. Miraculously she was okay, but we have no idea how. . . . . Morale of the story? Puppy-proof your house! One summer morning my husband and I decided to leave Savannah outside in the backyard while we were at work. Did you know that Rottweiler dogs can spell? When we first got Savannah, we called her snacks "treats" and when we wanted to refer to them without her knowing what we were talking about, we would simply spell out the word T R E A T.
It sure didn't take her long to figure out what we were talking about, and my boy Chevy has also learned how to spell "treat" "cookie" and "ready" (as in to go somewhere), etc. Do You Have a Great Story About Rottweiler Dogs? Rotties have so much character, some of their antics can keep you in stitches. If a Rottweiler has been part of your family for any length of time, then I know you have some kind of story to share. Whether it be funny, crazy or even maybe a little scary, like the one above when Chevy crashed through a plate glass window - Yikes! You and your Rottweiler can have your own page right here on my website to share with the world. Let's show the whole world how awesome Rottweiler dogs really are! Click here to see the rest of the form and tell us your great story. 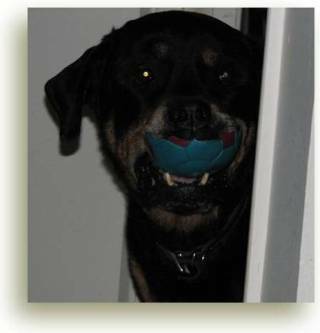 Take a Look at Other Visitor's Rottie Stories. . .
Loss of a Best Friend!! !